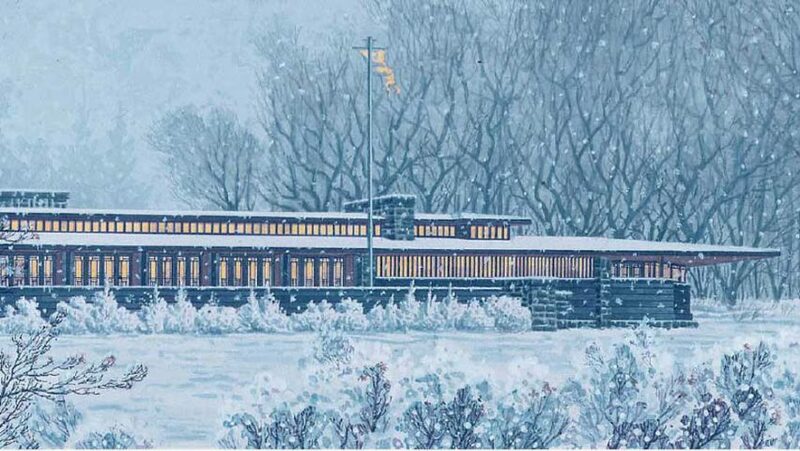 The Frank Lloyd Wright Revival Initiative plans to resurrect the architect's demolished or unbuilt projects, starting with a pavilion in Banff, Canada. The organisation wants to celebrate the lost work of the renowned American architect by using his drawings to construct the buildings anew, and raising the funds to do so. The Frank Lloyd Wright Revival Initiative was founded by filmmaker Michael Miner. He has made several documentaries about the Wright, whose best-known projects include the Guggenheim Museum in New York and the Fallingwater house in Pennsylvania. First on Miner's agenda is to recreate a park pavilion that Wright designed for Banff with his student Francis C Sullivan in 1911, but was demolished in 1939. The 200-foot-long (61-metre) structure featured a low roof and accentuated horizontal elements typical of the architect's prairie style. Miner's proposal is backed by Wright's grandson Eric Lloyd Wright, who studied at the Taliesin West school under his grandfather and has helped to restore several of his structures. The city of Banff has also given preliminary approval for the project, but the city council still needs to sign off the plans. The estimated $2 million (£1.6 million) needed to complete the project is being raised through small donations and sponsorship from construction material suppliers. "We chose this project because on paper it was the simplest, least expensive, and most feasible," Miner told Architect Magazine. "We thought it was a wonderful project to get our feet wet and show what can be done." If the Banff project is successful, the initiative will move on to the 1963 Pilgrim Congregational Church in Redding, California. The building was only partially completed due to cost constraints at the time, and Miner hopes to bring it to fruition in its entirety. There has been growing interest in Wright's lost work in recent months. Architect David Romero created colour visualisations of a pair of his now-demolished buildings, and gave the same treatment to an unbuilt chapel. The architectural legacy of Wright, who died in 1959, has had mixed fate in recent years. Ten of his buildings, including Fallingwater and the Guggenheim, were nominated for the UNESCO World Heritage list in 2015. A 1940s house he built in Wisconsin was recently restored and extended, and an unrealised dwelling was constructed in Florida 74 years after it was designed. However, others projects like a home in Arizona have faced demolition, while a house in New Jersey was planned to be shipped to Italy.